In honor of Global Accessibility Awareness Day, we would like to share a story of how technology has empowered a young man to create community, reach his goals and achieve his dreams. This is our time! My son, Micah Fialka-Feldman is now 31 years old and throughout his life has been given the opportunity to use technology to learn, listen, share, organize, and advocate for himself and for others. 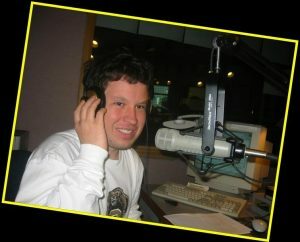 He presents at local and national conferences of 500 people with the assistance of technologies like PowerPoint and videos to share his story. It is common for him to get hundreds of “likes” and comments on his Facebook page. He updates his posts and keeps in touch via texting and emails. In our family, we do not call it adaptive technology or supportive technology – it is simply technology. 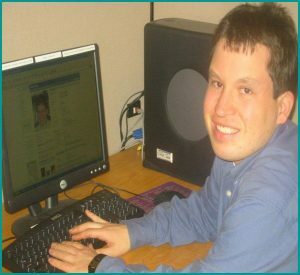 Not only is Micah one of the Post-ADA (Americans with Disabilities Act) generation of young adults, he also came of age with the emergence of life changing technologies such as personal computers, voice recognition software like Dragon Dictation (Dragon®NaturallySpeaking), screen readers, smartphones, and videos. He has the audacious expectation that he has a right to anything and everything that allows him to reach his potential as a human being. In 2016 we do not have to spend 20 hours adjusting the voice recognition software to understand Micah’s voice and words. Instead, Micah uses his iPhone with built-in dictation, voice technology and the digital assistant, Siri. With other emerging technologies like 3-D Printers and Fabricators, we are entering a new stage in human history where our children, our young adults and people of all abilities can use technology to create meaningful work in the community. Our family believes that every human being needs to be given the opportunity to reach his or her potential, and no one can do it alone. When I speak of the “commitment to create community,” I want to emphasize the idea of interdependence – knowing that every human being has gifts to advance our world. Our family had the honor and privilege to create a three day family workshop and training at the Kirkridge Retreat Center with a group of families and young adults with disabilities from the TIP Program. Together it is Possible! After Micah shared his story of inclusion using PowerPoint, each young adult presented his or her own PowerPoint, telling their own stories. The pride and dignity gained from sharing stories in a variety of media such as text, videos, pictures, and music were made possible by technology and thus created the foundation for these young adults to then deepen self-advocacy via public discussion. This experience fundamentally creates a space to recruit and invite individuals to a circle of friends and support, thus replacing shame with the honor to ask for help and the honor to move from independence to interdependence, which is the basis of community. Mobile technology has allowed Micah to be both independent and to call upon others for assistance that encourages interdependence. Breaking the silence and asking for help demonstrates a commitment to belonging and opportunities for each individual to express their human potential. Our children do not have to adapt, nor fit in, nor beg. They can lead the way to create a better world for themselves and others. We live in a time when a circle of support can create the kind of community where all–I mean all–can create our own futures. Rich Feldman can be contacted here. Check back with our blog next month when we share more of Micah’s story.